Hole pattern for motor is drilled to fit on a variety of engines. This mount will fit various common engines, including the Predator engines from Harbor Freight. Most common to find this spacing on a Honda GX series motor 6.5hp or below, as well as Loncin and Lifan motors 6.5hp or below. Pump side holes are tapped for M8-1.25 bolts. Removable safety cover is included. Lovejoy-type, CNC machined from a solid block of steel. 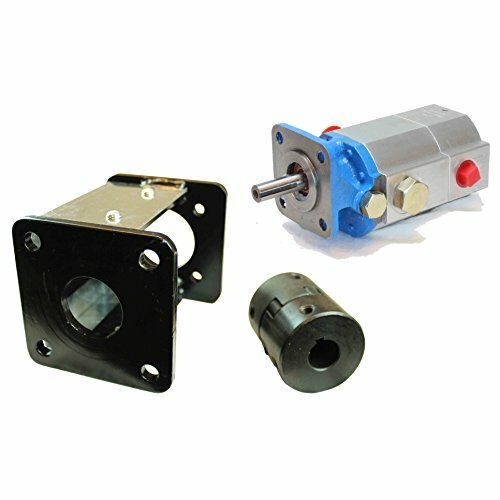 Suitable for connecting engines and motors to hydraulic pumps on construction equipment, agricultural equipment, and log splitters. Includes elastomer spider, and set/grub screws. The mount included with this pump and coupler will fit various common engines, including the Predator engines from Harbor Freight. It is most common to find this engine side bracket spacing on a Honda GX Series motor 6.5hp or below, as well as Loncin and Lifan motors 6.5hp or below. If you have any questions about this product by RuggedMade, contact us by completing and submitting the form below. If you are looking for a specif part number, please include it with your message.